Chopta is about a mile from Baniyakund. Along the way are a few tea shops and flophouses. 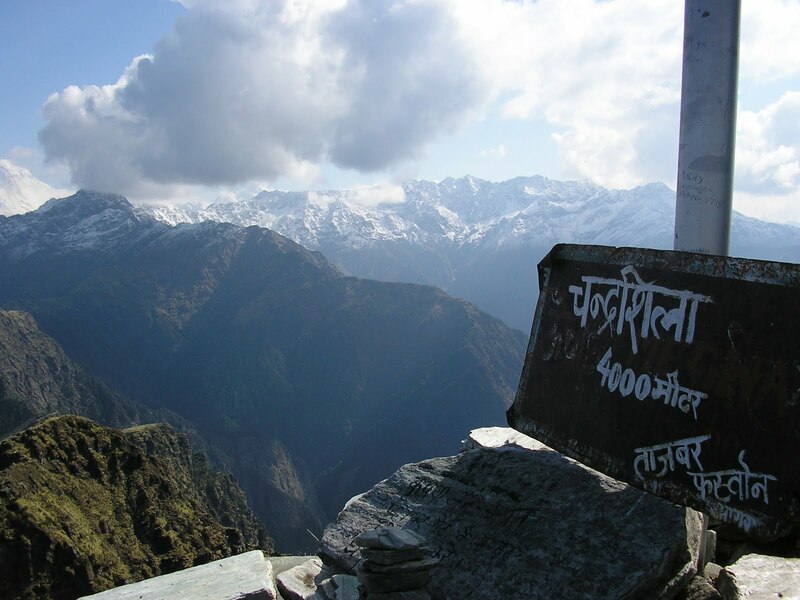 The trail to Tunganath starts at Chopta. 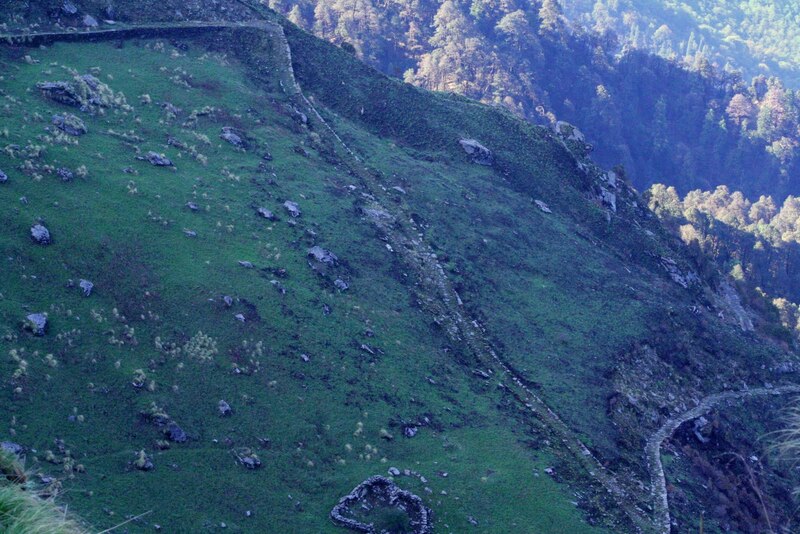 The main road carries on to the right and below from Chopta to Bhulkona, a mile away. From there, the road descends to Pangarbasa. The way lies through a deep forest, undulating like a giant snake through the dense canopy. The forest ends at the village of Mandal. From there the road carries on via Gopeshwar to meet the Badrinath road at Chamoli. 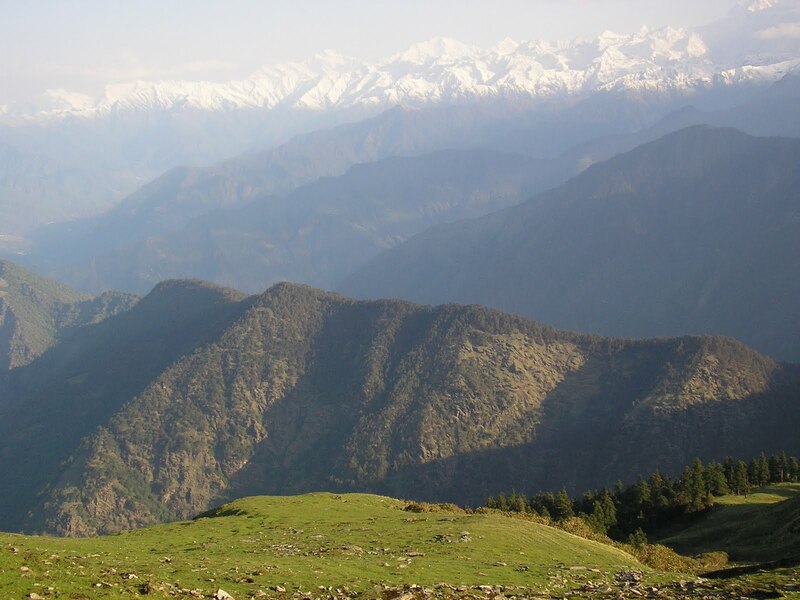 However, those who venture up to Tunganath need not retrace their steps to Chopta. A pilgrim trail runs down over a pass below the Chandrashila summit, connecting Tunganath to Bhulkona below. It’s a steep, zig zag route down which you hurtle as if someone were pushing you off the mountain. From Tunganath, Chamoli is some18 miles. We cross a waterfall just before we reach the temple- the Akash-Ganga. A few houses, a couple of tea shops and a dharamshala. Foregrounded by the distant snow-giants lies the beautiful temple of Tunganath, looking like a giant Shiv lingam. The lingam worshipped here is of natural origin- a swayambhu lingam. It looks like the rear end of the mythical buffalo form that Shiva took to escape underground. The deities of the other four Kedars are also worshipped here. Tunganath is a still, peaceful place. It is over 12,000 feet in height- the weather is biting cold. Hardly any yatri stays the night here. They pay their respects to the deity and go down to Bhulkona or Pangarbasa, sometimes even all the way to Mandalchoti. Further above the temple lies the peak of Chandrashila. You follow a thin track up to the top. At places, even this excuse of a track vanishes. The peak is about a mile or so from the temple, and a good thousand feet higher. The track passes through little patches of grass, jumbles of boulders and the occasional thin stream. Small flowers dot the grass like a patchwork of colour. You can also find deep crimson rhododendron flowers- the nectar from these flowers taste divine. 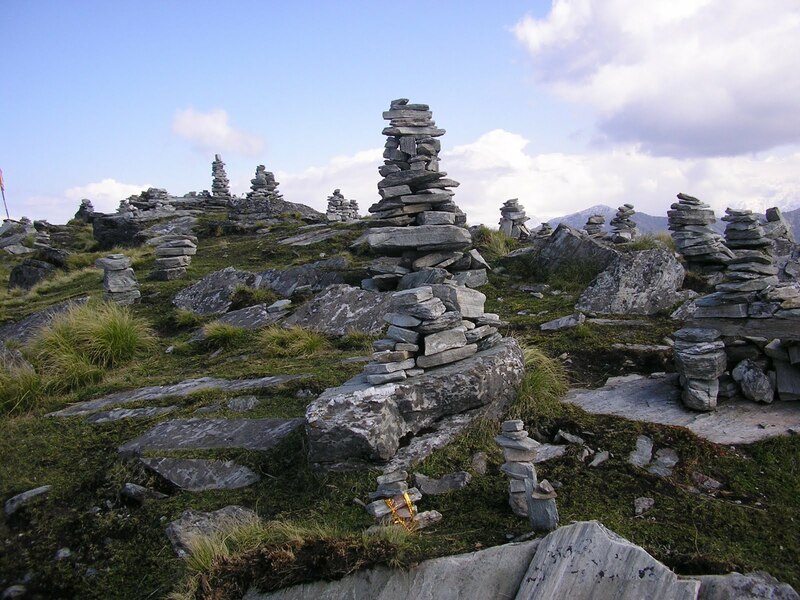 On the peak, there’s a short clearing dotted with cairns. Some of the stones are so placed that they remind me of the ruins of an old village or a castle. On the way to Tibet or in the higher reaches of the Himalayas, I have come across colourful cloth and paper flags. Similar flags fly here. 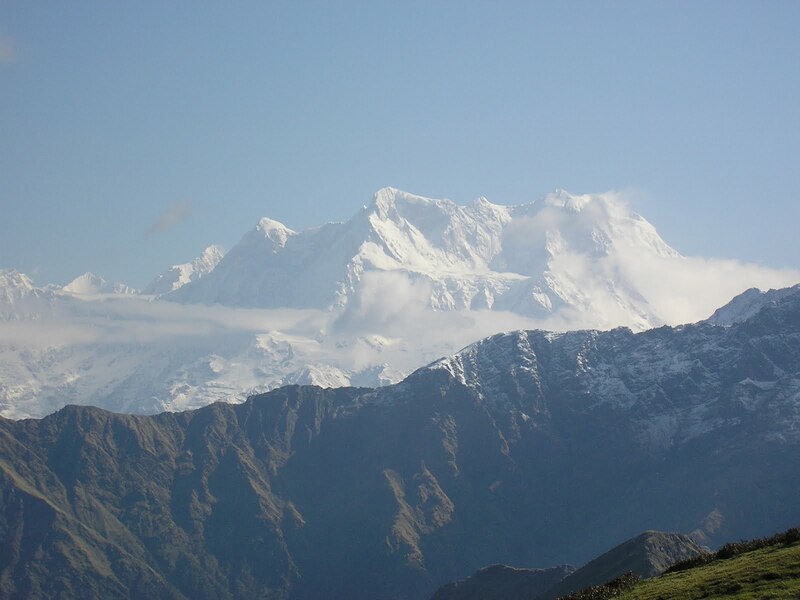 At over 13,000 feet, Chandrashila is the highest mountain in the area. The uninterrupted 360 degree view you get from here is breathtaking. In the distance, you can see an unbroken wall of snow peaks- Bandarpooch, Gangotri, Kedarnath, Chaukhamba. On the other side, Nanda Ghunti, Trishul, Dunagiri, Nanda Devi. They look unreal, like figures etched in a white chalk over a blue slate. From here you look down into valleys so deep that it feels like you’re peering into the underworld. 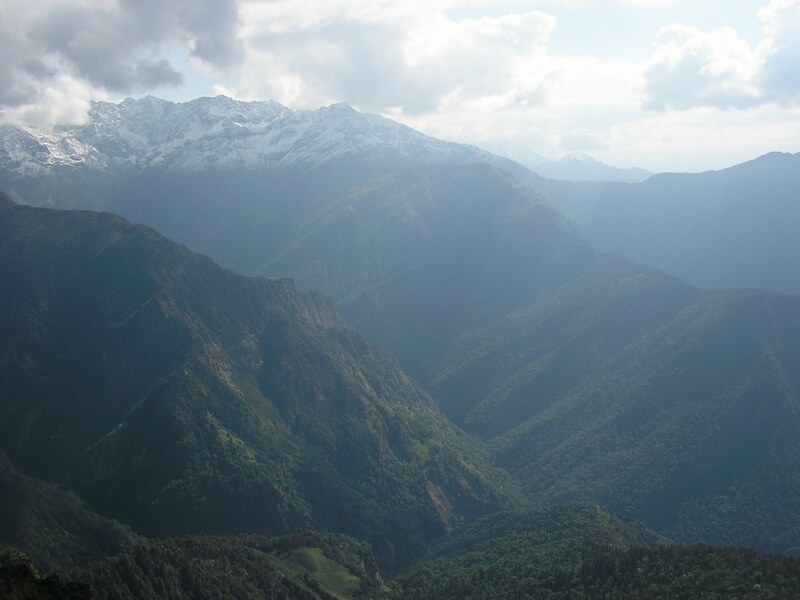 You can make out the faint white ribbon of a gushing mountain river; deep forests cloak the sides of some mountains; other slopes are barren- covered in hard, rough granite. Many thousands of feet below, you can see little villages and farms that look like miniature carpets. The dolls’ houses make me feel like I’ve stumbled into the playpen of the Nature. Somewhere there in those villages a dog barks. To me it seems the mountains themselves are speaking. The same pilgrim paths from where I could see the massive peak of Tunganath are lost to view from here. 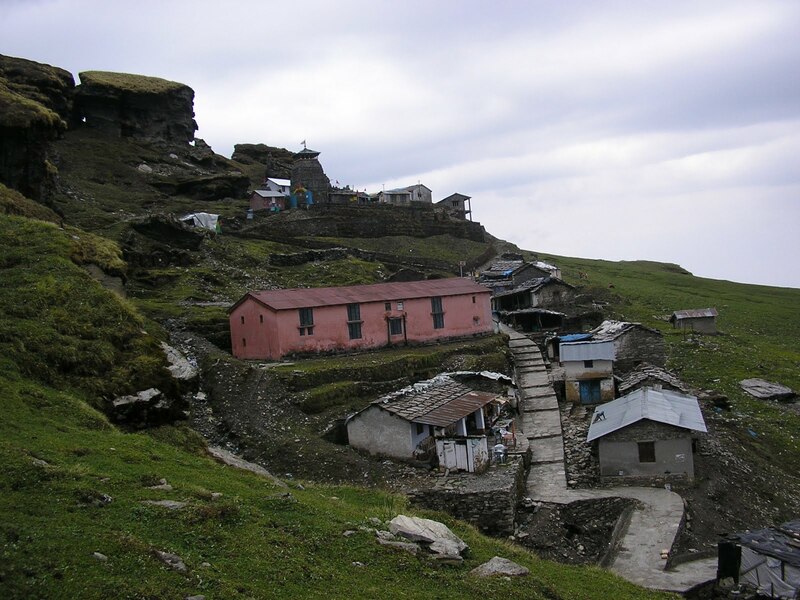 The enormity of the mountains of the Himalayas swallows up the trail to Kedarnath. I sit still and look at this majestic scene, and my mind dances out of time. How can I describe the perfect silence of that height? A deep, pervasive sense of peace fills me. Chandrashila is the best reward of the hard trail to Tunganath. Hi !thanks for those amazingly clear and beautiful pictures from CHANDRASHILA.I myself saw admired and photographed the sunrise (and the whole day through- till sunset during two days in 1995, but the paperpictures then were grainy and not compareable to your digital shots.When I meditate your pictures on my screen with the transparent light coming from behind I feel almost like being there again. This is like a gift from heaven, thanks very very much indeed.WIth greetings from Canada Satyavan—P.S. Let me offer you one trick which you will like a lot : when you have a wide view before you try to make connected shots in a horizontally connected series so you can stick them together later on with simple software or by hand on the computer. If you want I can scan and send you a sample of my paperpictures showing the whole Horizon (360 degrees) seen from Tungnath, just the Quality is not very good on paper. from my view point translation is very good.time passes but nature remains the same.you saw the same tunganath as him.